I wrote this during calligraphy class on Tuesday night 31 July 2012 in NAFA. One thing I learned is: it may seem ok when I look at this piece in real life, but after looking the its digital photo, I realized that the strokes I wrote are uneven: some words have thicker and thinner strokes, so it's "not nice" to look at from a distance. This helps me to pay more attention to avoiding these mistakes when I practice writing these characters again in calligraphy class. 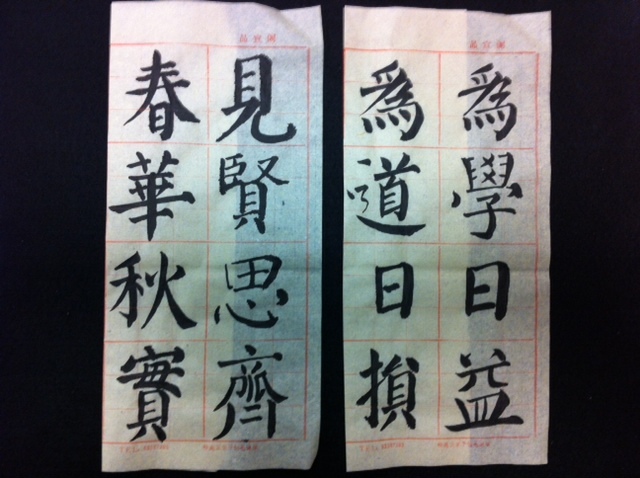 These are another 2 pieces that I wrote during calligraphy class on Tuesday night 31 July 2012. The calligraphy teacher, Mdm Feng, also taught us how to fold a big blank piece of paper so that we can use the grid lines as guides for the characters. At this point, this is the 25th week of lessons conducted by Mdm Feng of NAFA (the middle of the 3rd semester in NAFA). I have attended 23 lessons in total because I missed 2 lessons. 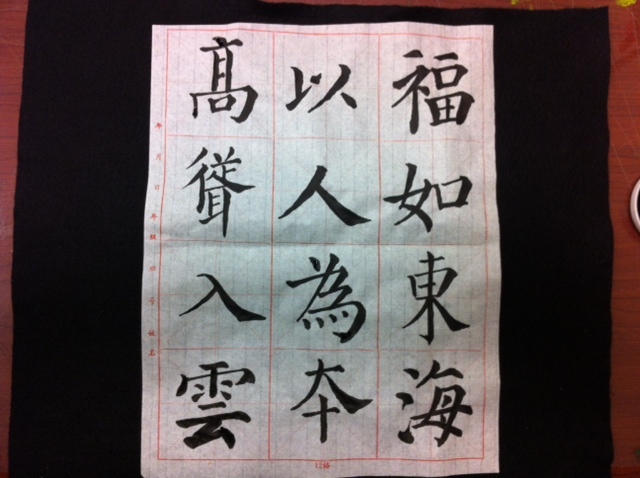 25 weeks ago, I do not know anything about Chinese calligraphy or even how to hold a brush. Thank you Madam Feng! I don't do any calligraphy practice at home. No time.